May God hold your family close during this difficult time, they are in my prayers. Our duty as law officers takes us onto one of the most dangerous battlefields - a United States highway. No matter the caution and the training, a crash can be as fatal as any encounter we might face. 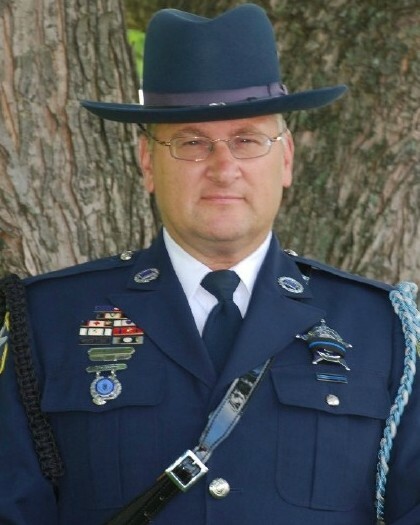 We regret that our brother Mark would be the latest law officer statistic on our highways. Fate, apparently, has deemed it to be so. We pray for Mark's family, friends, co-workers and all who care about him. May they be ready to reach-out to one another in the days ahead. We are proud to render Constable Mark Scianna, a soldier-of-the-law, a final salute. RIP Mark... We love you and your family will be taken care of!!! IT ALWAYS SADDENS ME TO HEAR OF THE TRAGIC DEATH OF A FELLOW LAW ENFORCEMENT OFFICER. THANK YOU FOR YOUR SERVICE, MAY YOU REST IN PEACE. I have always been so good with words, but for the first time in my life I am speechless. I could go on and on about you and how amazing you were, but everyone who knew you knows that already. Even if someone only had the pleasure of meeting you once; even if was becasue you were arresting them! ; they could see just how special you were. You truly believed in what you did and the law enforcement community lost one of its best officers that fateful night. What I am going to miss the most is the man you were after you took the uniform off. I will miss your smile and that crazy imagination that you had! You always knew how to make me smile :) You always had the right words to say in my darkest moments, and if you did'nt, your eyes said them without you even needing to open your mouth. But I am glad you did, because you had one of the most brilliant smiles I have ever seen. You meant more to me than I ever allowed you to know and for that I will carry a heavy heart until I see you again. It is always said that you never know how much time you have here on earth, and this will be my most painful reminder of that. As many people have already said, you need not worry about your son, he will be well taken care of and looked after. He, much like you, is quite amazing and I know that he gets that from his father! Mark you gave him everything that you had and more, and he has your strength and courage. Even though you are not here to sing to him, or take him on anymore of the many adventures that you two were always getting yourselves into, he knows that you are always with him, right there by his side. 23 And when he had sent the multitudes away,he went up into a mountain apart to pray: and when the evening was come,he was there alone.24 But the ship was now in the midst of the sea, tossed with waves:for the wind was contrary.25 And in the forth watch of the night JESUS went unto them, walking on the sea.26 And when the disciples saw him walking on the sea, they were troubled, saying, It is a spirit;and they cried out for fear.27 But straightaway JESUS spake unto them saying, BE OF GOOD CHEER; IT IS I; BE NOT AFRAID. Matthew chapter 14. When I heard you on the radio I felt a peace that only those who served with you will understand. Though I worked in the sleepy Shavano Park, I knew when you were on, because justice was happening. You will not be forgotten. Rest In Peace Brother. Watch over your fellow officers as they continue on with the watch in your memory. My condolences to your Family and the Bexar County Constable's Office. OUR ENTIRE STAFF SENDS OUR PRAYERS TO THE FAMILY OF PO SCIANNA AND TO THE BCCO. YOUR SERVICE TO THIS COUNTRY WILL ALWAYS BE HONORED. RIP BROTHER MARK. OIG Spec Ops / Airport Security Div. On behalf of my department I would like to send our condolences to the family and department of Sgt. Scianna. May you rest in peace and may God bring comfort to your family. Mark, there are just no words.......I will miss you, my friend. Rest in peace, Sgt. Scianna. Thank you for your years of dedicated service to your community. Your ultimate sacrifice and that of your family will not be forgotten. Prayers for your family, friends, Bexar County Constable's Office and law enforcement brothers & sisters. Godspeed & God Bless, Hero.